Minaei, H., Kahrizi, D., Zebarjadi, A. (2015). Effect of Plant Growth Regulators and Explant Type upon Cell Dedifferentiation and Callus Induction in Chickpea (Cicer arietinum L.). Journal of Applied Biotechnology Reports, 2(2), 241-244. Hamzeh Minaei; Danial Kahrizi; Alireza Zebarjadi. "Effect of Plant Growth Regulators and Explant Type upon Cell Dedifferentiation and Callus Induction in Chickpea (Cicer arietinum L.)". 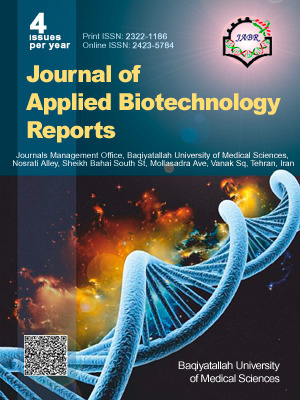 Journal of Applied Biotechnology Reports, 2, 2, 2015, 241-244. Minaei, H., Kahrizi, D., Zebarjadi, A. (2015). 'Effect of Plant Growth Regulators and Explant Type upon Cell Dedifferentiation and Callus Induction in Chickpea (Cicer arietinum L.)', Journal of Applied Biotechnology Reports, 2(2), pp. 241-244. Minaei, H., Kahrizi, D., Zebarjadi, A. Effect of Plant Growth Regulators and Explant Type upon Cell Dedifferentiation and Callus Induction in Chickpea (Cicer arietinum L.). Journal of Applied Biotechnology Reports, 2015; 2(2): 241-244. Chickpea (Cicer arietinum L.) is one of the most important sources of plant-based proteins. Somaclonal variation is a method for increasing the variation. The most common factors affecting somaclonal variation are explant types and growth regulators, in which the culture is established. The aim of the current research was to investigate the effect of the different growth regulators and explants sources on the induction of callus in chickpea (Bivanij cultivar). The callus induction experiment was conducted in MS medium supplemented by different concentrations of 2, 4-D (0, 1, 2 and 4 mg/L) plus 0.1 m/L BAP in five explants (embryo, seed, root, hypocotyls and cotyledon). The evaluated traits include days to callus induction, callus induction percentage and callus growth rate. The results showed that the best response of callus induction occurs in the medium supplemented by 2 mg/L 2, 4-D. The shortest time for callus induction was belong to embryo explant in the medium supplemented by 0.1 mg/L BAP + 1mg/L 2,4-D (4.25 days) and the longest time for callus induction was belong to cotyledon explant in the medium supplemented by 0.1mg/L BAP + 2 mg/L 2,4-D (14.25 days). The highest callus growth rate was belong to embryo in the medium supplemented by 1 mg/L 2, 4-D (0.1775 mm diameter/d)and the lowest was belong to cotyledon (0.02 mm diameter/d) in 4 mg/L 2, 4-D, and seed (0.01mm diameter/d) in 1 mg/L 2, 4-D.